What About Places Without Whole Grains? In certain areas of the world there is no longer whole grain agriculture, and no modern tradition for using whole grains. And in some areas of the world people have never used whole grains. If macrobiotics encourages the use of whole grains as the principle food, what can people in these areas do? Yes, they can try to import whole grains, and yes, they could attempt to start whole grain farming in their area. But what has the actual tradition been? What helped traditional people stay healthy in these areas of the world, for generations, without whole grains? In two words: complex carbohydrate. To be more specific: complex carbohydrate with intact fiber. “Intact fiber” is the key to healthy carbohydrate use. For example, white rice is primarily starch, and it is often surprising for many to learn that this is in fact a complex carbohydrate, but white rice has had its fiber removed in the refining process. Fiber allows for carbohydrate to be properly digested and more gradually converted to glucose before being absorbed and used as blood sugar. Complex carbohydrate foods taken with fiber intact have be proven to prevent diabetes, high cholesterol, and numerous digestive and colon problems. The healthiest carbohydrate is complex carbohydrate that comes in food with its fiber intact. Whole grains are one such food, but there are others. At the bottom of my macrobiotic food pyramid, I used to write “Whole Grain,” but I began to realize that was too limited. Now I write, “Foods containing complex carbohydrate and intact fiber.” This makes it possible for people in every part of the world to apply macrobiotic principles based on their locally available and traditional foods. Placing complex carbohydrate foods with intact fiber at the foundation of daily eating is the healthiest choice and individual and society at large can make, in my opinion. I was surprised to discover that Africa has had a tradition of whole grain as a principle food for thousands of years. This still exists in some isolated areas, and there are whole grains used that we have never heard of in the West. Some of these are pearl millet, fero. kam-kam, and African rice. Very unfortunately, colonization over the centuries has drastically diminished the growing of these whole grains, but there is a now a movement afoot to help restore the growing and consumption of traditional African whole grains. 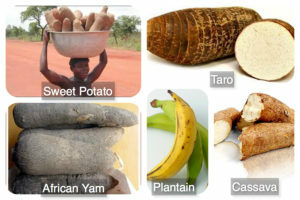 Traditional people in many tropical areas have relied on tubers for their complex fiber-rich carbohydrate. Some of these we know about, but there are many we in temperate climates have never heard of. 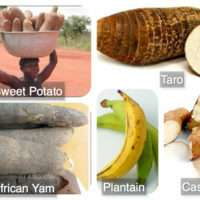 These include taro, manioc, cassava, and yam. Today there are various movements around the world actively teaching local people about the importance of restoring the dietary traditions of their ancestors by returning to using complex carbohydrate foods with intact fiber as the foundation food for daily eating. 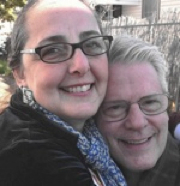 Without realizing it, they are teaching one of the basic macrobiotic principles of healthy eating for human beings. This is very good news! Some popular writers today advise the avoidance of complex carbohydrates, including whole grains, and they advocate the use of vegetables, fruits, seeds and nuts in their place. This won’t be possible for the entire world, or even all that healthy. The world’s population cannot be sustained on vegetables and fruits, or seeds and nuts. These are already very expensive, difficult to produce, require toxic agricultural chemicals to grow on a massive scale, and are wasteful of natural resources in their requirements for storage and transportation. Besides, the land simply isn’t there for this to be a possibility. Some write that there is no proven need for the human body to have complex carbohydrates such as whole grains as a source of nourishment. This is a misleading and myopic view, in my opinion. And it flies in the face of 50 years of scientific research supporting the multi-faceted benefits of complex carbohydrates and whole grains for our health. More than that, though, it dismisses our human dietary tradition of thousands of years. For the future, whole grain production and consumption will be the dietary savior of humanity and the earth. In those areas of the world where whole grain production may not be possible, as discussed previously, a return to the use of local and traditional foods that contain complex carbohydrate and intact fiber will be the essential dietary foundation. This has been our human dietary tradition for thousands of years, and so it must continue to be if thousands of years forward are to be possible. 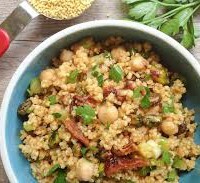 WHOLE GRAINS: Buckwheat Salad Can Reduce Heat. What? There’s been a long-standing prejudice toward buckwheat in the macrobiotic teachings. This is unfortunate as buckwheat can be a very nice addition to one’s whole grain repertoire. The macrobiotic view of many over the last 15 years has maintained a stubborn stance that buckwheat will make a person “too yang.” And since so many have developed a fear of being too yang, buckwheat is avoided. There is also the view that buckwheat is an exclusively cold weather grain since it is a favorite in Russia. “Buckwheat makes you yang and hot!” the macrobiotic counselor admonishes. As a result, it seems to me that the macrobiotic view has been unnecessarily one-dimensional when it comes to buckwheat. In Traditional Chinese Medicine, on the other hand, buckwheat is used to remove excess heat from the body. In Japan cool buckwheat (soba) noodles are used during the hottest and most humid days of the year to reduce heat and excess dampness in the body. If you’ve ever cooked whole buckwheat, you saw how much faster it absorbs water compared to all other whole grains. It has a water-absorbing nature. This can be useful for anyone who tends to pool excess dampness internally. This excess dampness can make one feel quite miserable on hot and humid days, because the moisture in the body that normally evaporates through the skin can’t, due to the excess moisture in the humid air. Eating some buckwheat or soba noodles can help. I don’t suggest that buckwheat is to be eaten three times daily for weeks on end. Just try it once. If it makes you feel hot, OK, then you won’t want to use it in hot weather. On the other hand, it might help you feel better in hot weather. You have to find out for yourself. Usually buckwheat dishes served in hot weather are served at room temperature, not hot. 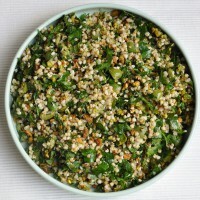 A favorite recipe of mine for a hot weather buckwheat dish is Buckwheat Salad. It is served at room temperature or, if you prefer, slightly chilled. Sauté finely chopped parsley in a very small amount of water. Mix the parsley with the buckwheat. Mix in the steamed, chopped kale and chopped sauerkraut. Mix the soy sauce and ginger juice, pour over the buckwheat salad, and mix in. 1. Place the cooked barley, chickpeas, red onion, red radish, celery, seitan and chick­peas in a mixing bowl. 2. Place a small amount of water in a saucepan and bring to a boil. 3. Boil the sweet corn for 1½ minutes, the carrot for 1½ minutes, and the green peas or green beans for 2 to 3 minutes. 4. Place in the mixing bowl. 5. Place ½ inch water in a saucepan and season with tamari soy sauce for a slightly salty flavor. 6. Place the shiitake mushrooms in the saucepan, cover, and bring to a boil. 7. Reduce the flame to medium?low and simmer for about 10 min­utes until tender. 9. Add the shiitake to the other ingredients in the mixing bowl. 10. Set the cooking water aside and use for soup stock. 1. 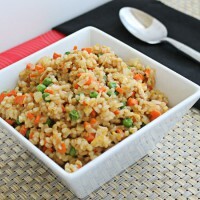 To prepare the dressing, place the tamari soy sauce and water in a sauce­pan and heat. 2. Turn off the flame, and add the ginger juice, and mix. 3. Mix the barley and vegetables in the mixing bowl. 4. Pour the tamari?ginger dressing over the barley salad just before serving. Place in a serving dish. 1. Place the millet, chickpeas, and red onion in a mixing bowl. 2. Blanch the green peas for 2 minutes in boiling water. 3. Remove, drain, and place in the mix­ing bowl. 4. Blanch the carrot for I minute, the burdock for 2 minutes, and the sweet corn for 1 ½ minutes. 5. Place in the mixing bowl. 1.Grind the umeboshi plums in a suribachi until it becomes a smooth paste. 2. Add the tahini and grind again until evenly mixed with the umeboshi. 3. Add the onion and grind. 4. Slowly add the water, pureeing constantly until the dressing is smooth and creamy. 5. Pour the dressing over the millet salad ingredients and mix thoroughly. 6. Place in a serving bowl. 7. Garnish with chopped chives. 1. Heat the oil in a skillet. 2. .Saute onions for 2-3 minutes. 3. Add carrot matchsticks and saute 2-3 minutes. Reduce flame. 4. Place the cooked rice on top of the onions and carrots. DO NOT MIX. 5. Add just enough water to create steam. Cover and allow to steam for about 10 minutes on a low flame. 6. Mix together. Season with a little shoyu, add the ginger juice, and continue steaming for another 3-4 minutes. Remove from heat.